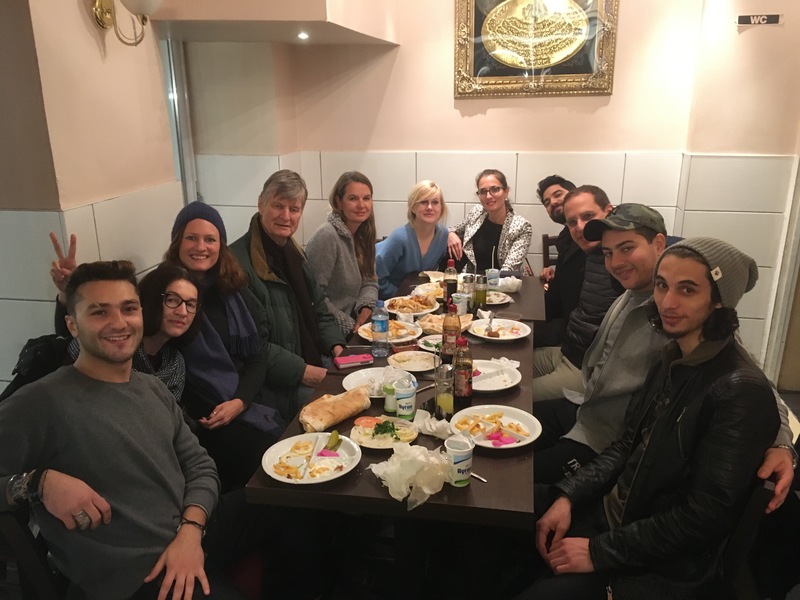 Closing dinner at the Damascus Grill on Sonnenallee with Berlin CDU politicians and some of GSBTB Syrian community members. It’s Tuesday morning in the Give Something Back to Berlin offices. The team is casually filling in for our weekly team meeting. Tuesdays are important to us; it’s the one time in the week when we all get together, plan ahead, review what’s been happening and see how we can support each other in days ahead. The chatter is excited, the hugs are being shared freely and coffee is being poured for all. Because of the nature of our work, for some of us, this is the only time we see each other all week. This morning the energy is particularly high because we’re excited to find that the whole team is here. It’s been at least a month since we’ve all been together, and as we start the review of activities, projects and meetings it becomes clear that one of the main things that’s been keeping us out of the office lately, and even out of Berlin, is our advocacy work, an area that’s become an increasing focus for us and our communities. GSBTB was represented at the World Global Summit in Dubai in March 2017. Since its start, GSBTB has been a platform that enables communities to meet and with the aim to create a structure that empowers both newcomers and established communities to influence the development of their city. From the beginning, this has meant that meetings and the sharing of ideas has happened one-to-one or in small groups. As a team we are dedicated to ensuring that people, particularly those that are most vulnerable in society, can have their voices heard as broadly as possible on issues that are of importance to them. This goal is entrenched in all our programs, tools and in the best practices we develop. Every team member sitting around the table today cherishes and believes in this founding principle. We believe that this approach has been key to our continued success. We listen and echo the voices of our members. We work together to increase our platform so that together our voices can be stronger. We do this in many ways – through extensive storytelling online as well as face-to-face, meetings with individual politicians, groups, companies, other NGO people as well as awareness raising campaigns on specific topics. 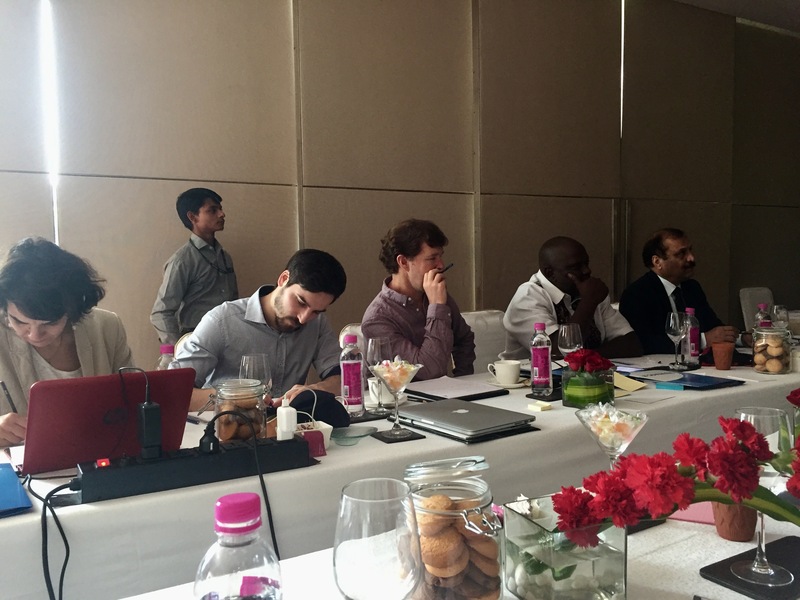 With the UNAOC and BMW Group’s Intercultural Innovation Award in New Delhi, working on strategies for intercultural dialogue. We are proud of the work we have done up to now and we are honoured by the awards and recognitions we have received for this work. Today as we meet and review the activities of the past weeks we are encouraged by the many opportunities this recognition has afforded us to increase the influence of our work far beyond our own reach and multiply our impact. Advocacy in all its forms seeks to ensure that people, particularly those who are most vulnerable in society, are able to: have their voice heard on issues that are important to them; defend and safeguard their rights; and have their views and wishes genuinely considered when decisions are being made about their lives. At GSBTB, we talk about integration, opening doors, building bridges and creating meeting points. Through advocacy we are scaling this work, broadcasting our messages, and sharing our best practices so that others can use us as a launching pad to continue these efforts in their own communities. Visit from the Canadian Leaders Roundtable on Immigration – a network of businesses, governments, immigrant-serving organisations, regulatory bodies, post-secondary institutions and researchers. Advocacy is challenging at times because, although it ultimately aims to serve and support the individual, the process of the work requires us to step away from the daily activities of the communities and into a more administrative, political role. As a small team we work hard and support each other to make it possible to find the time and resources to participate in this work. We do it because we understand that being present in all levels of the conversation is what is needed to ensure long-lasting sustainable change. We understand and gladly accept our responsibility as ambassadors to our communities. 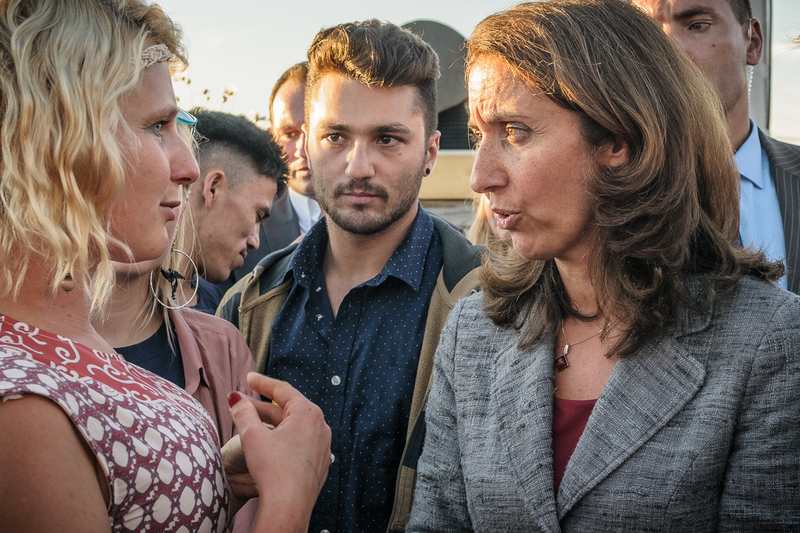 Aydan Özoguz, Minister of State in the German Chancellery and Commissioner for Immigration, Refugees and Integration speaking with GSBTB refugees and volunteer involved with GBSTB in September 2016. Just in the past month alone GSBTB team members have been invited to participate in both global as well as local political conversations. We’ve discussed the way forward for local intercultural dialogue with UNAOC and BMW Group in New Delhi in India, were invited to speak at the World Global Summit in Dubai, met groups of politicians and local NGOs from North Rhine-Westphalia in Germany, invited Syrians in our community to talk about arriving in Germany to local CDU politicians, hosted groups from San Fransisco re-modelling their university model for more inclusion and are currently gathering voices from the Tempelhof Refugee Camp to make their voices heard on the new plans for a container village on the Tempelhof Field. And that’s just this month! 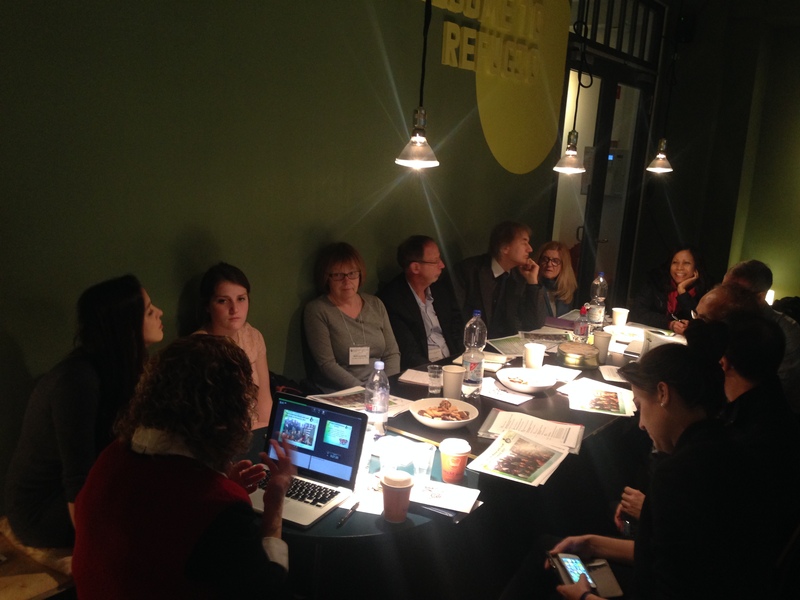 After these many events, conversations, and conferences we come together again to plan our next moves and priorities. We have worked together to ensure that we continue to be a local grassroots project, focused on the individual, working one-on-one with our many participants but that we take this work, what we learn, what we build and the impact we are make and give it a global platform. We are at once truly local and proudly global. This video was taken by a refugee woman involved in GSBTB Open Art Shelter living at Tempelhof Refugee Camp of the container village being built before her eyes, to bring awareness of what’s happening in their home.